California’s public schools have outstanding teachers and leaders, working hard every day of the year to help students thrive. We have innovative programs and talented practitioners in every part of the state. And yet, the general public is largely unaware of these assets. While surveys consistently show most families have a positive opinion of their own children’s public schools, many in the general public view many public schools as stagnant and struggling. No doubt, there are considerable challenges to face, inequities that demand a robust response. We also have great strengths to build upon, educators and programs deserving of support and worthy of recognition. In Capturing the Spark, veteran educator and writer David B. Cohen takes readers inside the classrooms of over 75 teachers, to see inspired teaching and thriving schools up close. Unlike other education books, Cohen doesn’t call for imitation of so-called “best practices” or issue any call to “scale up.” A program that works in one place will not necessarily work in another, and imitation is not in itself an improvement strategy. 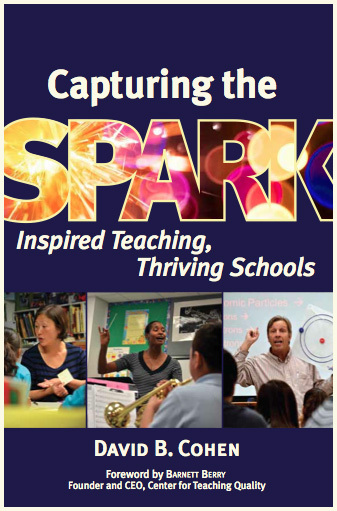 Capturing the Spark argues that all concerned stakeholders need to understand and foster the underlying conditions that allow sparks to ignite growth and innovation in any school or district. or by special order at your local bookstore!